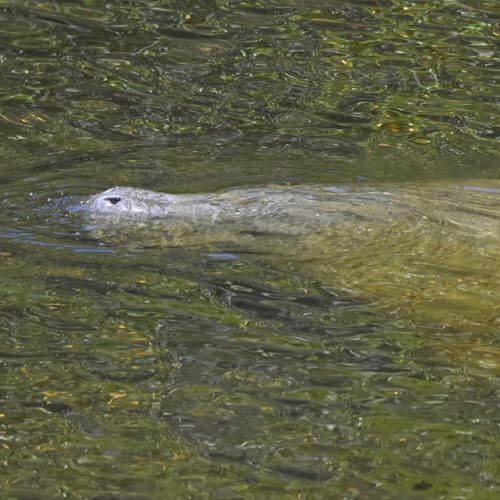 West Indian Manatee, photographed on the Loxahatchee River, Jonathan Dickinson State Park, Hobe Sound, Martin County, in May 2016. They are shadows as seen from above, massive creatures who spend their day slowly dancing through Florida's coastal waters looking for a mouthful of grass to devour, then another and another, to sate their equally massive appetites. Be patient; they do reveal themselves as they rise to breathe, but just barely, for the briefest of moments, before becoming shadows again. These shadows are West Indian manatees, Trichechus manatus. And massive they are, commonly reaching 10 feet long and weighing more than a half-ton. A few have approached two tons. And they do spend much of their day eating — manatees will consume between four and nine percent of their body weight each day, all aquatic plants. Some manatee basics: They are mammals, which means they must surface to breathe. Manatees can remain underwater for as long as 12 minutes, but usually stay for less than five. When they do come up, it's for a quick gulp of air that usually exposes little more than their nostrals before returning to the water. Manatees found in Florida are actually a subspecies of the West Indian, scientifically known as Trichechus manatas latirostris. Manatees have large paddle-like tails that propel the animals through the water, and two smaller flippers that are used for steering. They do migrate, some moving to cooler waters in the summer and to warm spots, like natural springs and power plant discharges in the winter. One of the best spots to see these creatures by the dozen is the manatee lagoon in Riviera Beach built by Florida Power & Light at a discharge point. It's free to the public. Their range extends throughout Florida, into Georgia and along the Texas coast. In summer, they've been spotted as far north as Maryland. The Caribbean and Central America are also part of the West Indian's normal range. Manatees are protected federally as an endangered species, and under Florida law, which declares the entire state to be a manatee refuge and sanctuary. Surveys done in 2016 put the manatee population in the vicinity of 6,300, up from less 1,300 a quarter century ago. The rangewide population has been estimated at more than 13,000. Because of the increase, the U.S. 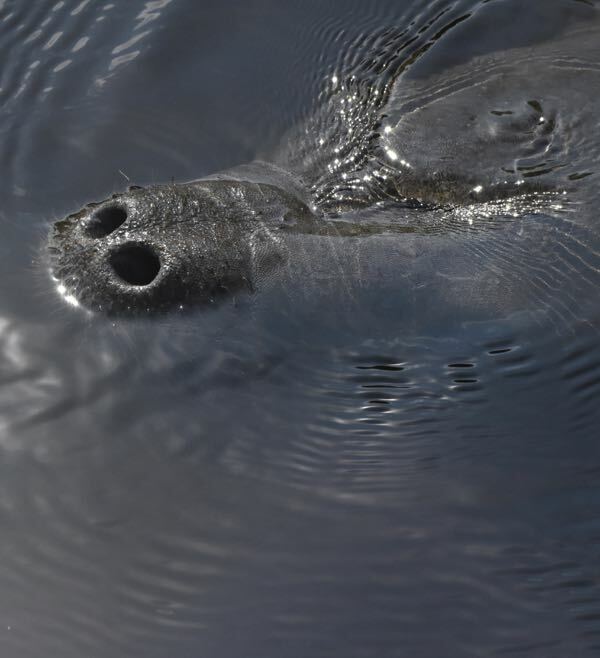 Fish and Wildlife Service has proposed moving the manatee up a notch to threatened, which would afford a little less protection. The International Union for Conservation of Nature still considers the West Indian manatee and two other manatee species as at risk for extinction. Despite the population surge, manatees face major threats to their well being, most notably boat traffic and loss of habitat. Many of the warm water springs that they depend on in winter have been lost to development and pollution. Even manmade sources of warm water, the power plants, might dwindle as utilities move to more efficient generating technologies. On Florida's west coast, red tide, a toxic algae, is a problem. Manatees also don't reproduce quickly or in large numbers, which has to be factored into any conservation plan. They reach sexual maturity between three and 10 years; gestation is about 13 months, and usually a single calf is born. Females will bear young every two to five years. Newborns nurse from their mother, but are also have teeth, allowing them to eat plants just like mom weeks after brith. They'll remain with mom for two years. Manatees can live relatively long lives — well into their sixties, in fact. Most, however, fall short of 30 and many don't see their 10th birthday. Christopher Columbus and his crew were the first Europeans to see a West Indian manatee, and the animal somehow evoked images of mermaids, the mythical half-woman half-fish creature, in their minds. Of course, they had been at sea for a long, long time. Others, however, saw manatees and thought dinner time. 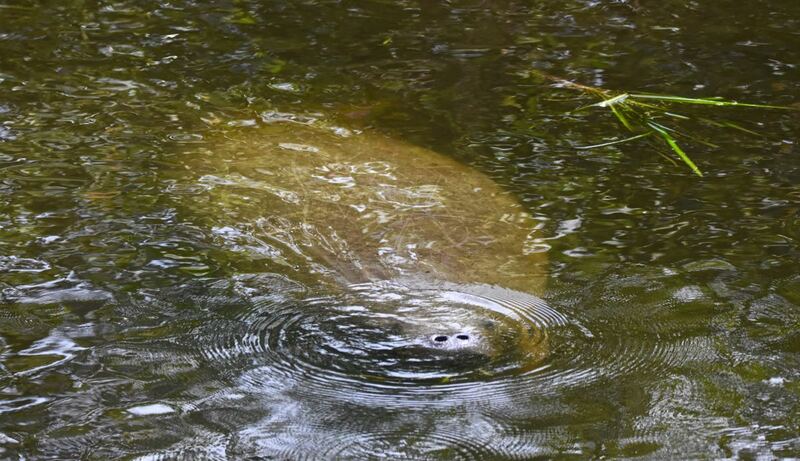 There is archaeological evidence dating as far back as 8500 BC that Florida's first residents hunted manatees. The Seminoles hunted manatees for the meat, oil, bones and hides. They'd sell excess meat to the Spanish. Florida banned hunting in 1893 and 1907, setting a $500 fine for anyone caught poaching. Still, the practice was common in parts of the state through the Depression and World War II. But if the West Indian has had it rough at the hands of humans, consider that a species of manatee known as Steller's sea cow was hunted to extinction within 27 years of its discovery by Europeans. They are agile animals, and fast swimmers despite their size. They've been clocked in bursts at 15 miles per hour, but typically cruise at two to six. Their size seems to protect them from alligators — they generally ignore the presence of the carnivorous reptiles. Manatees have excellect hearing and are able to communicate with each other by making underwater sounds. Their brains, however, are smaller in relationship to body mass than other mammals.